Some of you may think this post is not serious but it is serious because the Oracle Confirmatory is a very important NPC Building. It's where we, Outlanders, flag and deflag for PvP and it's also where we take our daily Virtue Test for our free 500 gold. In most player owned towns, the Oracle Confirmatory is right next the entrance of town or somewhere near and visible from the entrance but that's not the case in Beran's Reach. The first time I arrived here in Beran's Reach after the town's redesign, I think I spent a few minutes just looking for the Oracle Confirmatory. I ran around the entire town and found a lot of new things like the town's new Market Area with row houses on each side and a gustball field at the center. I also found the Crafting Center behind some Row Houses, the High Rock Brewery next to my Snowmen Sanctuary, the large Bear Tavern right smack at the center of town behind the Gustball Field and a few more buildings and properties. I found a lot of things inside the walled city of Beran's Reach but the one important thing that I didn't find is the Oracle Confirmatory. 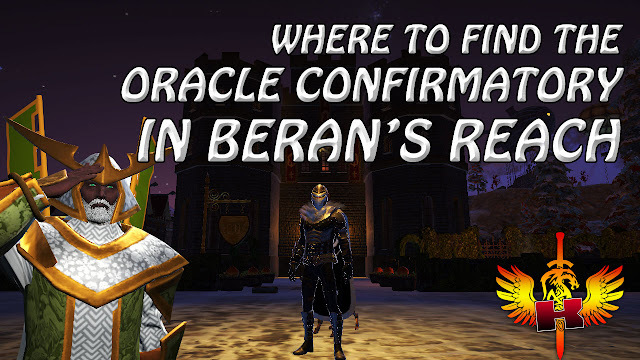 I continued running around town looking for the Oracle Confirmatory and I eventually found it while I was running and looking around on the walls of Beran's Reach. So, where did I find the Oracle Confirmatory? Well, the Oracle Confirmatory was located outside of the walls of Beran's Reach and it was just a few seconds away from the Town Entrance. To find the Oracle Confirmatory, just turn around, face east and run forward from the Town Entrance and you'll find the Oracle Confirmatory as well as 7 Devotionals. Anyway, now that we know where to find the Oracle Confirmatory in Beran's Reach. I can now say thank you and see you in New Britannia. Bye bye.